I’ve been obsessed with the codes of queer life since I was an infant sitting on my grandmother’s lap, feeling The Days of Our Lives coursing through my veins, each episode a grain of sand in the infinity of pleasures that only come with excessive feeling. It can take a lifetime of Lifetime movies to learn the language of melodrama, but careful study reveals queer life’s basic tenets: What’s bad is actually good; what’s good is tragic and morally suspect. What’s impossible is right around the corner. Apropos of his homo-topics, Goldberg writes beautifully, in prose vulnerable and oppositional that elevates academic vernacular to a higher aesthetic plane. The best chapter of the book dishes lavish gossip on melodrama’s holy trinity: Douglas Sirk, Werner Fassbinder, and Todd Haynes. I was enchanted, for example, to discover that Haynes studied under feminist film scholar Mary Ann Doane at Brown, where he wrote a thesis on Querelle (heavily excerpted by Goldberg here). There’s an appreciative consideration of feminism in Haynes films, which manifest as “lesbian utopics” for Goldberg. Smart stuff here too on imitation, Wildean personality, and legacies of style, and have I mentioned the book cover image is Jane Wyman at her vanity in All That Heaven Allows? In an exciting gay literary cross-over event, D. A. Miller’s concurrent release, Hidden Hitchcock, makes for a matched set of tenured cinephile treasure troves. In fact, the two co-conspire over Hitchcock and this process Miller thinks he’s invented called “too close reading,” which, frankly, feels like a sham. (Didn’t David Halperin already do this on an epic scale in How to Be Gay? Don’t we all do this on YouTube every day?). Lucky for us, Goldberg’s decided we can’t have our Hitchcock without our Highsmith, and aren’t they a lovely pair. He writes about music in Hitchcock (something rarely considered) and explores how Highsmith thematizes music in her novels. In a single chapter, Goldberg treats us to a grisly retelling of Strangers on a Train, a salty take on the star-studded adaptation of The Talented Mr. Ripley (“Minghella seems to think he has made a feminist film…”), and an electrified trip through Highsmith’s sequels Ripley’s Game and Ripley Under Water. If, like me, you were raised on just this brand of extra-curricular art drama, you will trust Goldberg’s fast-paced, suspenseful ekphrasis and delight in reliving these extraordinary reversals on the page. And yet. 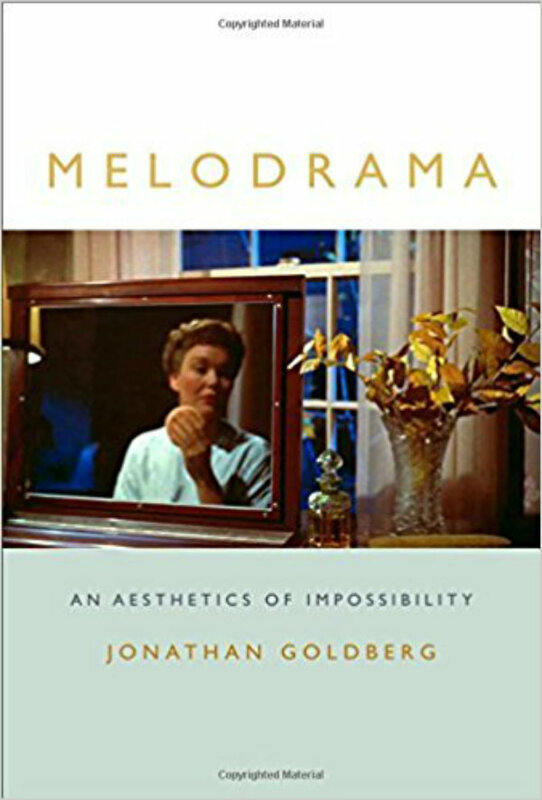 With a canon that begins with Beethoven’s Fidelio and ends with Willa Cather’s “Paul’s Case”; Goldberg centers Melodrama squarely in the mid-Century on the backs of male auteurs. Given a framing that mostly looks to high art and already established queer classics, the aesthetic considered here is more inevitable than impossible. “Exploring the insistence of nonidentity in the melodramatic mode” may only work when reading white, male-authored texts. But there’s so much I want him to make sense of in this elaborate framework he’s worked so hard to produce. After all, the golden age of melodrama characteristically displays textbook white fragility alongside iconic feminist strength. Our contemporary melodramatic forms (and their mixed bags of victimhood)—from talk show drama to the rise and fall of Empire, from The Handmaiden to Moonlight, from the videos of Paula Abdul to the root reflexivity of Big Little Lies—function as perfect rejoinders to the fiction of self-contained whiteness. For decades, this codified form has been repurposed and put to use in contexts as varied as performance art, horror, and, of course, politics. Obviously, others have and do figure melodrama through a more diverse canon, theorizing fandom and the social over identification and the individual. The culture of melodrama—attending as it does to themes of care and isolation, betrayal and collectivity—is as instructive to me as its queer aesthetics. This seems crucial to remember while people in power claim outsider positions in a public sphere where white melodrama functions overtly as a political tool. The aesthetics of melodrama are also its politics—it’s impossible to get around this—as even Sirk, Fassbinder, and Haynes attest again and again.